YouTube You Can Use – Volume 2, Issue 37. 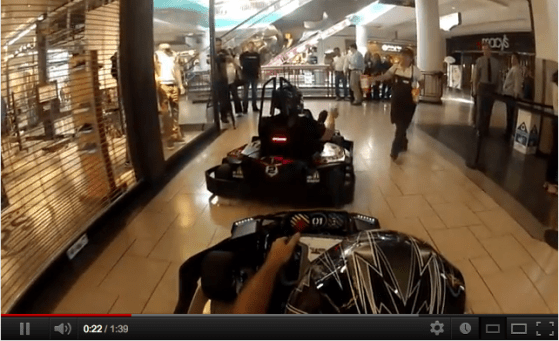 “Attention mall shoppers, walk on the left and leave room for the go karts racing through the food court.” That’s an announcement you’ll never hear at the mall! Just imagine how crazy that would be to do on the day after Thanksgiving. Watching that video, obviously a commercial and not real life, you could see how much fun it was to film it. As they learned, it’s one thing to imagine how much fun it’d be to drive a go-kart through a mall, it has to be ten times as fun to actually do it. In John 10 Jesus says, “The thief comes only to steal and kill and destroy; I have come that they may have life, and have it to the full.” As a Christian, it’s easy to think that everyone else gets to have all the fun. But Jesus reminds us that living for Him isn’t boring at all, he wants us to live life to the fullest! What kind of public space would you like to go-kart through? In your opinion, what would living life to the fullest look like for you? Have you ever done something in Jesus’ name and thought, “Wow, that was really amazing/fun/exciting?” If so, what was it? If Jesus wants us to live life to the fullest, how come following Him isn’t always fun?